A resonant debut novel about retreating from the world after losing everything—and the connections that force you to rejoin it. Since the night of the crash, Wren Wells has been running away. Though she lived through the accident that killed her boyfriend Patrick, the girl she used to be didn’t survive. Instead of heading off to college as planned, Wren retreats to her father’s studio in the far-north woods of Maine. Somehwere she can be alone. Debut author, Amy McNamara’s, stunning portrait of a young woman’s grief in the most extreme stage shall touch the heart of every reader. 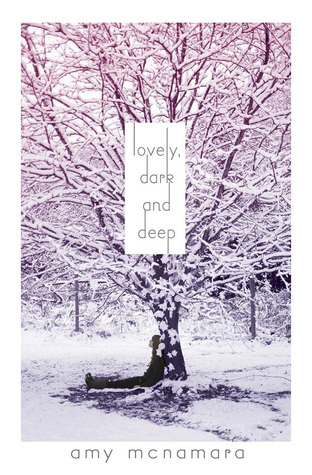 Lovely, Dark, and Deep’s Wren Wells may be a pseudo-recluse living in a secluded area in Maine with her father, but she lays her pain on the table for any who bother to see. The death of Wren’s boyfriend, Patrick, and the many factors that surround his death, sends her life off-course. Living with her sculpting father, Wren hopes to get herself straightened out and back to pursuing her carefully laid out goals. Her time spent out of touch with society: friends, work, and passion, leave her parents worried and her mind close to shutting down. The aspect of living in the small town that Wren didn’t count on, was finding a reason to emerge from the darkness in which she’s shrouded herself. Wren is strong, even when she feels like hiding away from the world, but she knows that her misery is something that’s physically and mentally holding her back. Characters that are, at least, partially aware of themselves in such a manner are fascinating to read about. Wren walks herself towards moving on from a tragic accident, though not without help, but she pushes readers toward encouraging her, backtracks toward pitying her, then comes full circle to hopefulness that she’ll finally make real progress. Cal Owens flows into the novel like a knight in shining armor, almost. He has his own story that I wish McNamara could have explained in more detail, because I wasn’t too familiar with the source of his troubles, but overall he added to the path of hope Wren could choose to ignore or follow. Wren and Cal are drawn together by their similarities and differences when it comes to dealing with grief. Wren draws into herself, vowing to remain silent until she can sort through her issues, while Cal pretends his situation isn’t as grave as it really is. His quick temper contradicts the calm he radiates for Cal, molding him into one of the most realistic characterizations of a love interest I’ve seen in young adult fiction. McNamara’s style of writing is easygoing, yet packs a wallop of emotion. The writing excellently portrays Wren’s flow of consciousness through a variety of sentence length and structure. The dialogue is straightforward, even when a moment of profundity surrounds the speaking character. Knowing that the characters are saying more with fewer words lends the reader a sense of time. It never feels as though a scene is unnaturally long, or that a person in real life would never say so much at one time. Lovely, Dark, and Deep sends a riot of emotions through me when I just think about Wren’s story. Reading her story is a comfort and an experience, because it is such a possibility. This is truly a universal story that will not only entertain readers who love a sad story that pushes its protagonist toward happiness, but also speaks to the many people affected by grief and other strong emotions.